A low growing species with bright yellow flowers, Achillea clypeolata is a very attractive addition to the cottage garden. Our first experience with the species was when we first created this web site. This was available from Norgates Plant Farm at Trentham, one of the original mail order nurseries in Australia, it is now Frogmore Gardens, and they carry on a great tradition. This is an Achillea that is slow spread and is evergreen, the foliage through the year makes it a good ground cover plant. This is such a good plant that a number of named cultivars are available, however we are not convinced that any are better than the species. 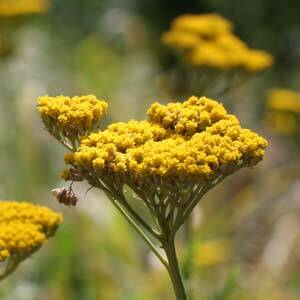 It has also been used in hybridisation, so Achillea ‘Moonshine’ is said to be a hybrid as is ‘Credo’. This is an easy care drought tolerant plant once established. It will spread slowly to form a dense clump. Best planted in spring in a well prepared weed free soil. In poor soils dig in some well rotted compost before planting. Water in well and mulch around the new planting to prevent weeds from establishing. Water through the first summer, after this you will find that Achillea clypeolata is relatively maintenance free. Height – will reach around 60cm in height.